I was recently given this knife as a gift and I absolutely fell in love with it! Columbia River makes incredible blades, knives, and tools and the M16 series lives up to the name. 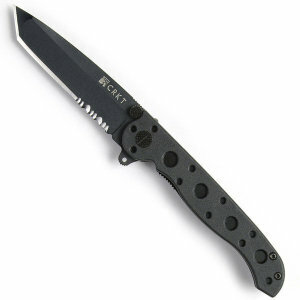 This knife is super lightweight at only 2.3 ounces, yet is tough as nails and won’t let you down. (Seriously, this thing is built to last.) I love the “Carson Flipper” which allows you to flip the blade open easily, quickly, and safely with only one hand! Better still is that the M16-10KZ comes with CRKT’s patented AutoLAWKS safety, so you never have to worry about it closing down on you unexpectedly. The 3″ blade is made of high quality steel, with a perfect edge and triple-point serrations making it able to easily cut through cord, vegetation, and who-know-what-else while out and about around town or in the wild. To top it off, it’s got a tactical look to it that’s impressive and intimidating. If you’re looking for a great every day carry knife, this is the one! Great for doing the dirty work, but won’t bust you up if you drop it in the stream. And it’s even made in the U.S.A., and we all love that! I carry this thing with me everywhere now and I’d feel lost and naked without it.